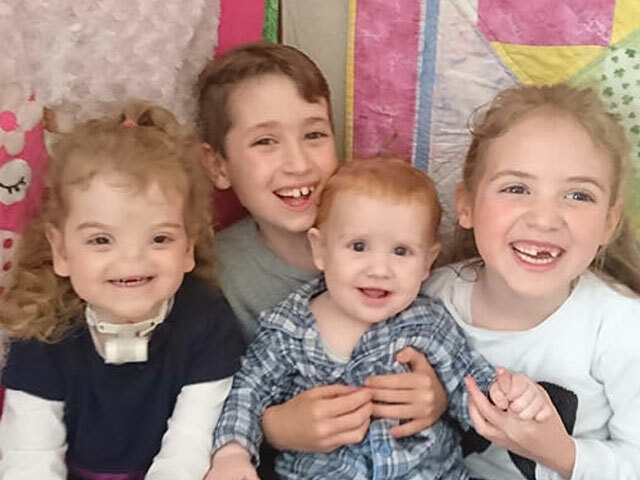 Grainne Evans shares how her family have coped with beautiful daughter Tessa’s rare medical condition, and how accommodation provided by the Sick Children’s Trust has been invaluable. Our daughter was born with an incredibly rare facial anomaly. She has a condition known as arhinia, which means her nose didn’t develop in my womb. It simply isn’t there. There are very few babies like her in the whole world. She was born, and will forever be, extraordinary. Tessa was born on Valentine’s Day 2013 at The Royal Victoria Hospital, Belfast and I was delighted that on the most love-filled day of the year, my baby girl made her entrance. She was born naturally with no pain relief in a hospital birthing pool. Her birth itself was extraordinary since I had had my previous two babies via caesarean section and fought very hard to give her the best birth possible. Although at our 20 week scan an abnormally flat fetal profile had been detected and we were told to prepare to make difficult decisions, our follow-up scans and amniocentesis were all normal. So we were expecting a perfectly healthy baby. However, when Tessa arrived, it was undoubtedly the biggest shock of my life when I saw her face and that her nose was missing. Eventually, once doctors had stabilised her breathing, I was allowed to hold her for a few seconds. I kissed her forehead and told her I loved her before they took her away. I felt so lonely and helpless, I was supposed to protect my baby and be able to help but I couldn’t. There were tubes coming out of her tiny little body everywhere. 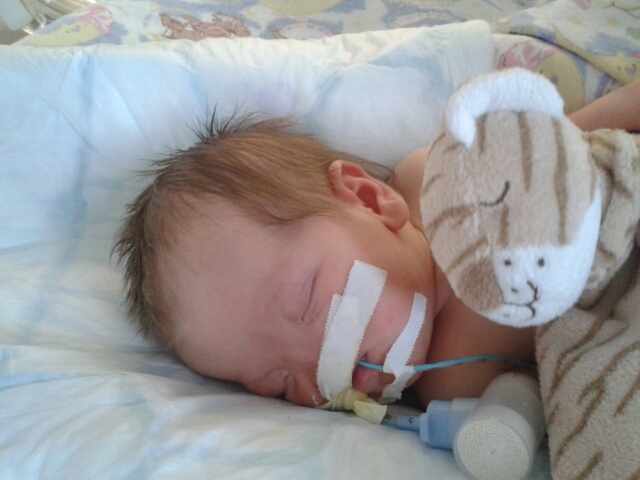 Tessa spent her first five weeks in a neonatal intensive care unit (NICU) in the hospital. We live in County Derry so it was a two hour round trip from home and they were the worst weeks of my life. 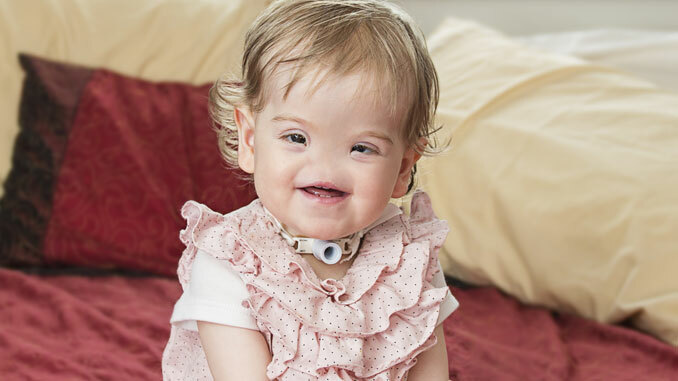 Tessa had her first surgery at eight days old to give her a second airway by means of a tracheostomy tube to allow her to eat and sleep safely. Sending her to theatre was every bit as terrifying as you can imagine but once her ‘trachy’ was in place and I completed the care training, it was our ticket home. Thankfully after 33 agonising days in hospital we were discharged. We were finally going to be together as a family with my two older children, Cassie and Cathal, albeit with a mountain of intimidating medical equipment and an exhausting list of follow-up and check-up appointments. The doctors had told me that Tessa wouldn’t be able to breastfeed and would be exclusively tube fed. But I knew my baby and I knew she could do it. It was the most incredible thing. She defied doctors’ predictions and from eight weeks onwards was able to breastfeed. I am humbled and grateful that I can hopefully inspire women around the world not to give up on their own dreams to breastfeed because Tessa and I managed it. After a lot of research I learned about a children’s cranio-facial plastic surgeon at Great Ormond Street Hospital (GOSH) in London who I felt we should meet. So in September 2013, my husband, Nathan, Tessa and I flew to London for two nights. After that initial appointment we had a lot to think about concerning Tessa’s future and finally we decided that it was in our daughter’s best interest to have a 3D cosmetic nasal implant fitted in London when the time was right. It would be the first surgery of its kind. And when that time came, myself and Nathan would be supported by The Sick Children’s Trust, a charity that would give us a ‘Home from Home’ when we needed to be as close to our daughter as possible. Tessa underwent the ground-breaking procedure at GOSH at the end of May 2015. 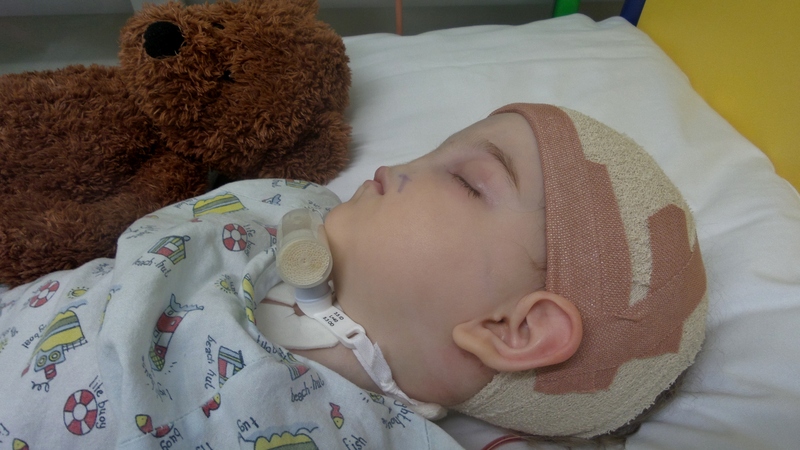 The two-hour operation carried out by surgeon Jonathan Britto involved the first part of the implant fitted through an incision in Tessa’s hairline. We thought she was so beautiful and so perfect, to let a surgeon do anything to change her was just heart-breaking. I know the night before her surgery her daddy and I were just in tears, but we knew this was the best option for our girl. I stayed by Tessa’s side those two nights when she was in hospital, but my husband slept at in a room just a few minutes away at Rainbow House, which is one of ten ‘Homes from Home’ run by The Sick Children’s Trust. We hadn’t thought about accommodation for me and Nathan. We simply assumed that it would be provided by the hospital. So when we visited the accommodation services at GOSH the day of Tessa’s operation it was a big shock to learn we couldn’t all stay together. Thank goodness for The Sick Children’s Trust. The accommodation services contacted them and fortunately they had a spare room for Nathan. I know at the time he was very impressed because he went out and bought lots of cleaning supplies to donate to Rainbow House before we left London. 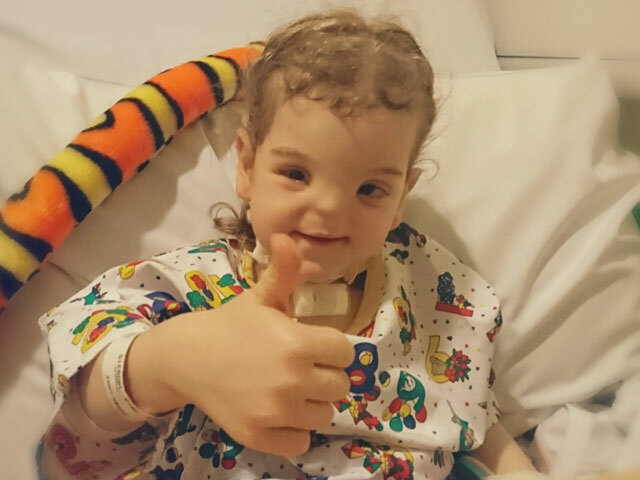 Tessa recently had the implant replaced again in September 2017, so the nose grows with her face, and this time I was the one to stay in a different ‘Home from Home’, Guilford Street House, which is also run by the charity. What was so amazing was that I had Tessa’s little brother, Naoise, with me this time and it was such a relief knowing I could take him somewhere to be with him at night. It was very stressful though, as I had never spent a night apart from Tessa, and it was quite soul destroying to leave her side each evening at 11pm. I was comforted by the fact I was a phone call away and could be there in just a few minutes. Whatever happened I would be by her side when she woke up the next day. And that was a gift. Guilford Street House was amazing and suitable for a baby boy too. It was full of toys and had a fully-stocked kitchen, and in our bedroom there was a direct line to the ward where Tessa was being looked after at GOSH. There was a comfy bed, no alarms, no monitors and no incessant beeping. I was able to sleep peacefully so I was strong for Tessa each morning. Nathan had told me what a homely environment Rainbow House had been for him two years earlier, but I got to see the beautiful standard at Guilford Street House myself. The Sick Children’s Trust was founded in 1982 by two paediatric specialists Dr Jon Pritchard and Professor James Malpas. Today we have ten ‘Homes from Home’ at major hospitals around the country where families can stay free of charge, for as long as they need whilst their child is undergoing treatment.